Robert Rodridguez says he watched John Woo movies early on and they made him (a) want to be Asian and (b) wish there was something comparable in modern cinema with a Latin flavor. I don’t personally totally get that, as those movies make me fantasize about being badass, but not any particular ethnic flavor of badass. But that’s me. When shooting Desperado in a small Mexican town, Robert Rodriguez noted that the locals assumed Danny Trejo was the star of the movie, even though his part was actually a small role as a knife-throwing assassin whose name Navajas means knives in Spanish. 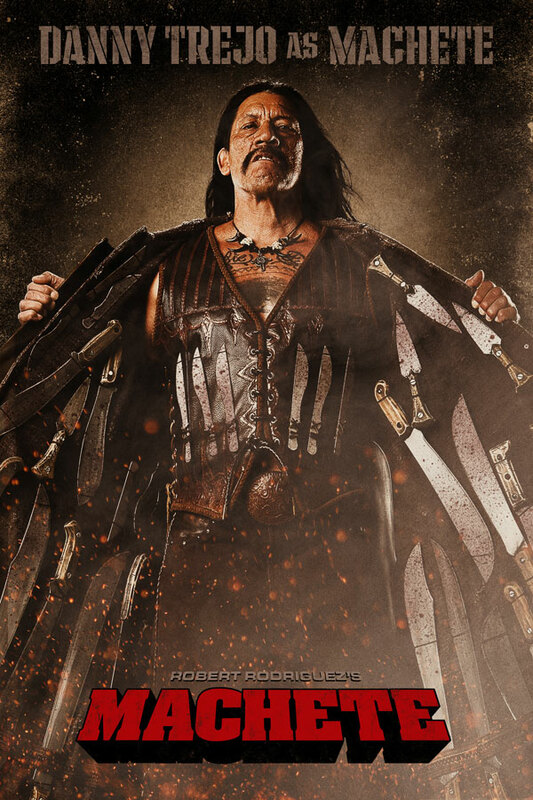 Robert Rodriguez always creates cool stuff and the cast for Machete looks amazing and amusing and creative. Robert De Niro, Jessica Alba, Steven Seagal, Michelle Rodriguez, Don Johnson, and Cheech “Up in Smoke” Marin, all in major roles in the same movie. Plus smaller bits with Lindsay Lohan, Tom “Bloody Stuff” Savini, and Rose McGowan. All this big screen action may have me seeing movies with multiple other humans in the room more often this year. Who Watches the Watchmen Movie?